A clean, crisp design and a gleaming smoothtop make this Bosch electric range an attractive piece in the kitchen and easy to clean with a hidden heating element. The radiant elements expand to two sizes, allowing you to fit nearly any pan size and maximize the heat use. The console panel is refreshingly simple and has push-to-turn dials that deter small child fingers. 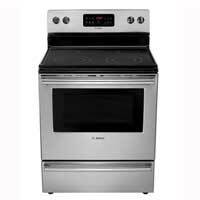 We noticed an usual paint smell in the oven that took several heatings to make go away; however, the overall appearance and performance are more than satisfactory and available for the reasonable price of $729.